When the Pentecostal movement exploded in 1906 in Zion City, Ill., Fred Francis Bosworth was present. When the Assemblies of God was being formed, Bosworth served as one of its leaders. 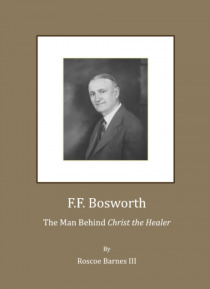 He also was present as a mentor to the tent revivalists in the 1940s and 1950s.This book is about the life and ministry of Bosworth (1877-1958), a Pentecostal pioneer, musician, famous healing evangelist, and the a… uthor of Christ the Healer. He reportedly led over a million people to Christ, and was considered by scholars and ministers alike to be one of the most successful healing evangelists of his era. His writings on divine healing influenced many church leaders of his day, as well many who claim healing ministries today. While many people are familiar with his book, Christ the Healer, few know much about the man behind the book. F.F. Bosworth is the first book to offer a critical analysis of Bosworth's life and ministry from the beginning to the end. The purpose of this work is to explore his life and ministry in order to identify and analyze some of the factors that contributed to his success as a famous healing evangelist.